ingdom to wildly enthusiastic audiences, and recently supported both The Black Keys and My Morning Jacket. 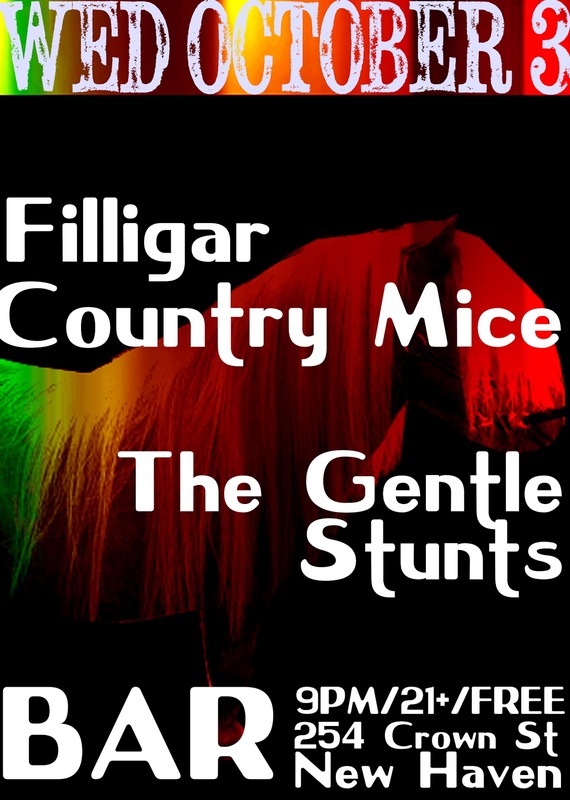 In December 2011, the powerhouse music blog RSL named Filligar one of the top 8 live acts in the USA, along with fellow Windy City band Wilco. Country Mice are a Brooklyn-based rock band whose music fuses the twang-infused melodies of Neil Young and Jeff Tweedy with the guitar firepower of vintage indie rockers such as Dinosaur Jr. and Sonic Youth. 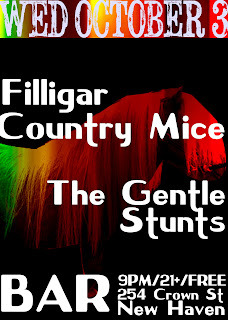 Country Mice were formed by Jason Rueger, who was born and raised in Beattie, Kansas, a small farming community with a population of roughly 300. While Beattie wasn't a haven for rock & roll, Rueger developed a serious interest in music as a youngster, and began playing guitar in his teens. Determined to make a career for himself as a musician, Rueger pulled up stakes and moved to Brooklyn, New York. While trying to make his way into the Brooklyn music scene, a friend introduced Rueger to Ben Bullington, a fellow guitarist who was also a Kansas transplant, and they began jamming together. While working a day job, Rueger met Kurt Kuehn, a drummer originally from Wisconsin, and he was recruited to join Rueger and Bullington's new band. The Gentle Stunts is a solo act with guest appearances from friends on various tracks. Over the past 2 years, Cal McNamara had begun to develop an insatiable love for writing and recording songs. He is 21 years old and has released two LP's. The songs are sharp and brief, but the variations in structure and melody leave the listeners wanting to take a closer look. From large pop gems to psych-rock apparitions, The Gentle Stunts take conventional indie music and pose it in a multitude of thought-provoking ways."